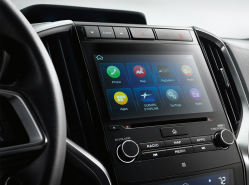 Subaru owners claim Starlink infotainment systems freeze and fail because of head units. December 26, 2018 — A Subaru Starlink lawsuit alleges the infotainment systems freeze and malfunction because the head units fail, and updates offered by the automaker have allegedly failed to fix the systems. The Starlink infotainment system offers touchscreen multimedia and video in the center console that includes the screen for the backup camera. In addition, the system includes the controls for the radio and audio system and the cell phone and navigation system. A driver can use the Starlink system with Android Auto, Apple CarPlay and Bluetooth. The proposed Subaru class-action lawsuit includes all current and former owners and lessees of the following vehicles equipped with Starlink systems. The Starlink systems consist of Harman Gen 3 audio and navigation head units, but the lawsuit alleges it's the head units that create safety concerns for Subaru drivers. Tennessee plaintiff Chad Udeen says he leased a new 2018 Subaru Outback and soon began experiencing problems with the Starlink system. Udeen claims the screen went blank multiple times and continued to get worse until the head unit failed in April 2018. The plaintiff says he contacted multiple dealerships and Subaru Corp but after several weeks still had not received a response. He says he was eventually told it would be a while because Starlink head units were on backorder, but in July he was contacted by a dealer to bring in the vehicle. However, Udeen says after waiting all day at the dealership he was again told the head unit was on backorder, meaning a trip back home without a working Starlink system. The lawsuit says the automaker eventually did replace the head unit a full six months after the Starlink system failed, but the plaintiff claims the system still has static and audio problems. Back-up camera freezes and/or shut downs. Failure of the system’s head unit with resulting loss of audio and radio functions. Complete system lock-up/error message displayed on infotainment system that only goes away after vehicle is turned off for several hours and then turned back on to properly reset entire system. Display shuts off even though functions of infotainment system remain working. Inability to shut radio/audio off or turn high volume level down (set automatically by way of technical glitch) when backing up. Radio automatically comes on at high volume when the car is turned on, even if the radio was off when the car was last turned off. Favorites from smartphone or connected device not being saved to the system. Audio/radio functioning is erratic, in that radio/audio will turn off at random intervals then come back on suddenly without warning. Bluetooth connectivity issues preventing phones from connecting properly and calls from being made as well as disabling Apple CarPlay or Android Auto functionality with the system. Starlink updates have allegedly failed to repair the problems and instructions sent by Subaru to dealers have allegedly been worthless. Some owners have allegedly had the Starlink head units replaced multiple times, but typically after waiting as long as six months for replacement units. Subaru customers also complain about turning off the engines with the Starlink screens frozen, resulting in drained batteries that strand drivers. In addition, there is a clear and present safety issue if a driver relies on a frozen backup camera screen believing the image is in real time. The automaker has allegedly issued at least two Starlink software updates to fix the head units, with version 2.17.43.30 released in December 2017, and version 0.18.22.20 released in July 2018. However, the plaintiffs claim some customers weren't helped much by the updates or by technical service bulletins (TSBs) issued by Subaru to dealerships. The TSBs allegedly relate to software updates, a replacement for the audio amplifier in order to correct audio problems and troubleshooting tips to diagnose problems with Bluetooth, Apple CarPlay, and Android Auto. According to the lawsuit, Subaru sent out surveys in January 2018 to certain customers and dealerships “to help identify, and in some cases address, customer concerns” with the Starlink systems. In addition, the plaintiffs claim Subaru intends on sending dealers TSBs in July 2019 concerning another Starlink update because past Starlink updates haven't worked. The Subaru Starlink lawsuit was filed in the U.S. District Court for the District of New Jersey - Chad Udeen, et al., v. Subaru of America, Inc. The plaintiffs are represented by Chimicles & Tikellis, and J. Llewellyn Mathews. CarComplaints.com has complaints from drivers of the vehicles named in the proposed class-action lawsuit.